Victraders.com: New Market Square Is To Be A Crowd Drawer. It was revealed in the latest QVM Renewal proposal that Market Square will be the name of the open space between QVM’s M Shed and Franklin St. The Square will be created once the current car park has been relocated, and it looks like it is going to be more than a simple park or garden. As the name suggests, a square or piazza has connotations of a community gathering place and that means crowds, and we don’t need to explain how important crowds are to market trading. 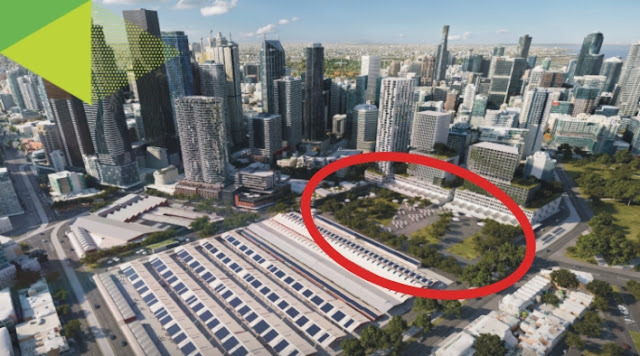 A charter is to be drawn up to guide the use of this space, but one thing is certain - creating a substantial new space (bigger than Federation Square) will at last offer an alternative location for public events currently being held down at Southbank or on the Yarra. Melbourne City North will have its own world class public activity space, and it is right next to our market.